Izzy is the co olest dinosaur you will ever meet. When he is not running away from a T-Rex or trying to light a fire with a volcano, he plays football, has fun with friends, falls in love and, most of all, takes it easy. Even when he has a spelling test! Dovi Keich is a comics artist and designer. Izzy first appeared in the 1990’s in a weekly children’s magazine. Its ongoing success led to the publication of AN IZZY YEAR. 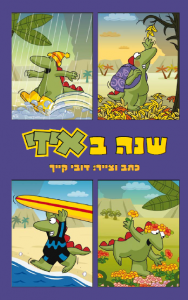 This entry was posted in Comics and tagged Kinneret Publishing on April 27, 2014 by sbarrouillet.